“My Diabetes Prevents Me.” COMICS! Sometimes It's A Theatre of Blood! 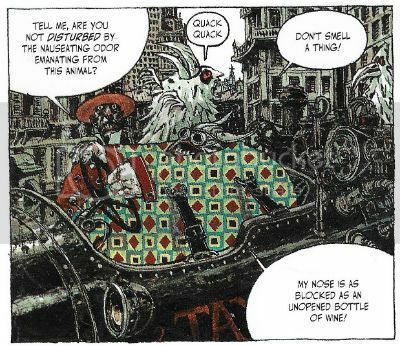 I think it’s only fair to state at the outset of the clueless drivel which follows that Foligatto, illustrated by Nicolas de Crécy and written by Alexios Tjoyas, is way out of my intellectual weight-class. It’s one thing to be able to dance nimbly around some tawdry work-for-hire featuring a character invented by men seemingly high on cough syrup, laying on the odd low blow and pretending something of worth has been achieved, but quite another thing to unwrap this gleefully fetid bon-bon. See the critic quail before the might of actual Art! See him run behind the skirts of Batman! Ah, not quite, or at least not quite yet. Because while I may come off like Tom Waits in Francis Ford Coppola’s Bram Stokers’ Dracula (phew! ), all unctuously hunched and servilely importuning as regards the imminent arrival of the masssster (de Crécy, not Dracula) while in fact only hastening my own ignominious end, it’s worth the risk if someone picks up this masterpiece, this Foligatto. Hopefully everyone will buy Foligatto, because only when De Crecy and Tjoyas are choking on gold can this world have the slightest claim to being Just. I’m not propelling a visible suspension of carbon or other particles in air (typically one emitted from a combusting substance) up your posterior when I claim Foligatto is a masterpiece. Seeing may be deceiving, but not today! Your eyes don’t lie! You can tell just by looking at Foligatto that it’s a different class of comic altogether. It’s the artwork that hits you first and hardest, pummelling your fragile skull with the capital “A” of Art. It is classy stuff, you might want to comb your hair and polish your shoes for this one. It’s the art you’ll hold hardest to your heart but, hopefully, not at the expense of the script. Tjoyas’ script is undeniably erudite and imbued with a cultural intelligence lacking from the average Spider-man comic, which is a shame as I’m more intellectually equipped for Spider-Man comics. Still, failure is my sweetheart so I’ll press on. Spiritually Foligatto’s art and story are saturated with German Romanticism. Alas, this does not mean there are crowds of Teutonic men proffering flowers and holding doors open for ladies in big hats, it refers instead to the European Romanticism which developed in the late 18th/early 19th Centuries in opposition to the typically dourer English Romanticism and the Enlightenment as a whole. The Enlightenment being known to close personal friends as “The Age of Reason”, German Romanticism naturally pushed back with an emphasis on the unnatural, the fantastic. Ernst Theodor Amadeus Hoffmann (E. T. A. Hoffmann) is the go-to-guy for examples of the fantastic as a burgeoning genre, and his work fits right into the Foligatto attitude. I’ll not fib, being a low class act I am primarily familiar with E.T.A. Hoffman via Michael Powell and Emeric Pressburger’s 1951 cinematic adaptation of Jacques Offenbach's opera, Tales of Hoffmann (1879/1881). 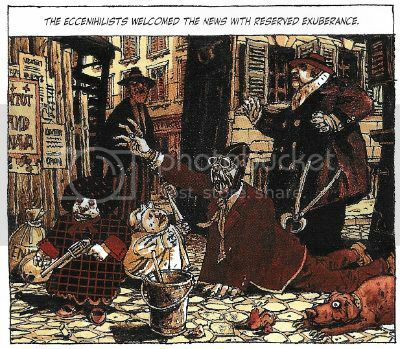 The handy link is that Offenbach’s opera is based three Hoffman tales: Der Sandmanon (The, er, Sandman), Rath Krespel (Councillor Krespel/The Cremona Violin) and Die Abenteuer der Silvester-Nacht (A New Year's Eve Adventure). At the risk of spoiling your next trip to the opera, the uncanny shenanigans include a man falling in love with a female automaton, a woman who risks death if she sings too much and the attempted theft of a reflection from a mirror. Fun stuff, kind of thing we all like to read about, because opera (“A bunch of fat people who got dressed in the dark, shouting.” said my Dad) might make most of us scarper sharpish but it turns out we’re just talking about the fantasy genre after all. 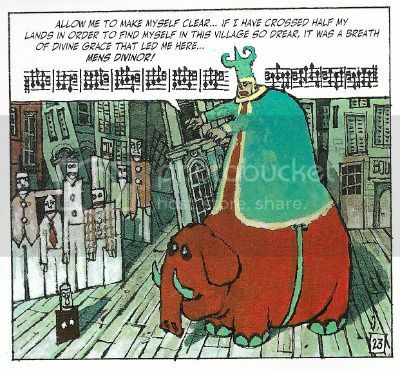 Basically, Opera is just comics for fops. Who knew? Probably Nicolas de Crécy and Alexios Tjoyas. They mayhap overtly reference the Offenbach influence by having Foligatto be a castrato Opera singer, and the Hoffmann influence by, well, having a world where absurdity and surrealism are the norm. The astonishing trick Tjoyas and De Crecy pull is they make the multitude of nonsensical aberrations on show credible. 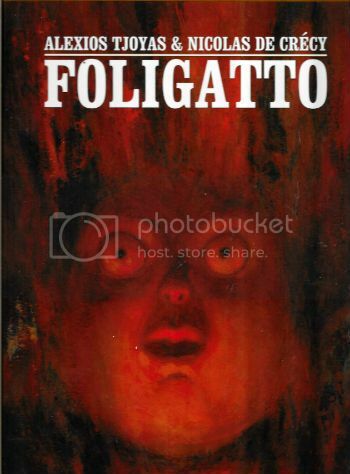 While reading Foligatto you will accept the fact that a man can pick up his severed head and trot off with it as easily as you do the fact of gravity. In fact gravity seems much less convincing on reflection because it isn’t drawn by Nicolas de Crécy. 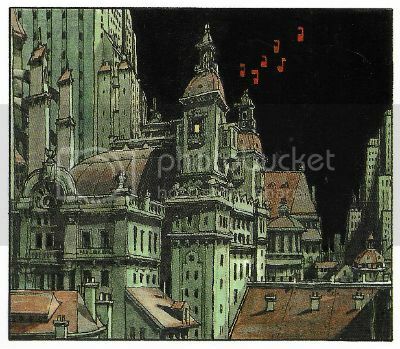 I jest there, but I jest not about the quality of the art; every panel is a little miracle, a joyful tweak of the possible, where the sheer delight of the artistry on show is the only threat to the ceaselessly downbeat tone of the work as a whole. This is bleak stuff, m’dears. 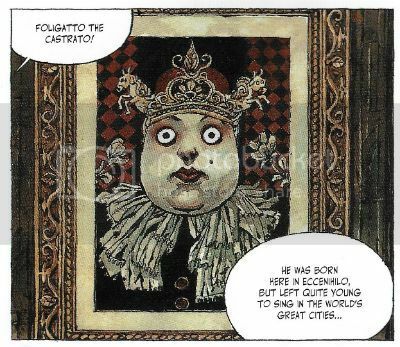 The city setting of Eccenihilo resembles a nightmare vision of 19th Century Italy. Grand, arresting buildings of dense stone loom over a warren of snaking streets populated by hunched, skittering, grotesques. Characters have faces so deeply quarried by life they resemble hangdog golems, except for Foligatto whose tautly rounded face is gravid with malevolence, a boil on the cusp of explosion. Life in the world of Foligatto is miserable and confounding even before the portly nightmare starts throwing people out of windows like perplexed puppets. The sky is a bleakly toned miasma and everything beneath it has the air of a fairy tale, but one spoiled and corrupted. Like a tale once told filled with gold and innocence has grown up along with us, and become as venal, baffled and lost as our adult selves. 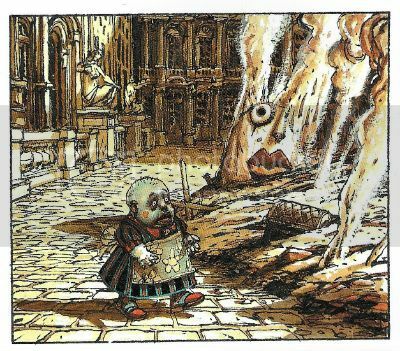 Think Andre Maurois’ Fattypuffs and Thinifers (1930) with illustrations by a depressive Raymond Briggs working largely in shades of faeces. That’s a comparison and as such short-changes the work, this Foligatto; the actuality is purely and wholly original, and purely and wholly the result of the ridiculously skilled pair, de Crécy and Tjoyas. NEXT TIME: I scamper back to my Comfort Zone of English – COMICS!! !